The owner of a shopping centre has won the right for a revamp despite claims it would "spoil the high street". 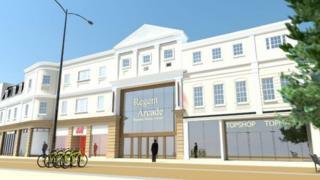 Regent Arcade in Cheltenham appealed against a council's refusal for the facelift of the entrance last year. In June, borough councillors criticised the architect's design, saying "we can do better". The £500,000 revamp would see the current stone arch and pillars entrance demolished and replaced with a large square filled with glass. The centre's owner, Canada Life, won an appeal against Cheltenham Borough Council's decision on 1 February. Now, inspector at the Planning Inspectorate JP Roberts has granted permission for the revamp. He said the works would be likely to "bring commercial benefits", according to the Local Democracy Reporting Service. Mr Roberts said: "The new glass and metal frame would appear as an obviously contemporary element, and its proportions would not reflect the classical theme of the rest of the façade, or mimic the proportions of the nearby shop fronts. "However, it would be generally in keeping with the extensive areas of glazing of the ground floor shop units."